We do off and on work in Portugal. 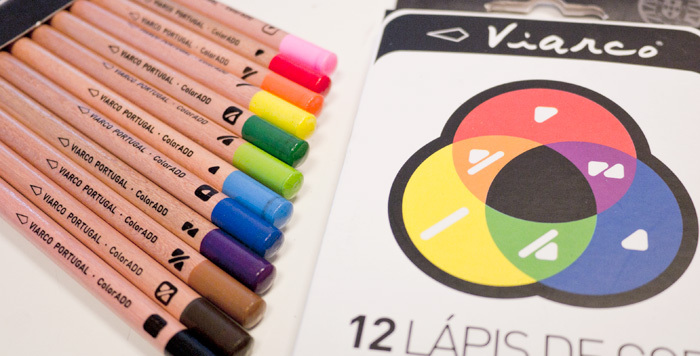 It was there we were introduced to the colorAdd color symbols used on these iconic pencils. As you can see, the colorAdd system is an alternative way to mark your colors with a visual symbol. This is useful for folks with vision deficiencies. If you see both red and green as brown, the addition of these symbols can help distinguish differences. The concept is pretty interesting. By merging the symbols, you get new color symbols. They follow similar patterns as mixing inks. The symbol for ‘red’ is the upper-left triangle. The symbol for ‘blue’ is a lower-right triangle. When you combine the two to make a box shape, this is the symbol for purple, which is also the result of mixing red and blue. Orange and Green work in similar fashion with red and yellow symbols and yellow and blue symbols. To get lighter and darker versions, you can put a solid or hollow box around the symbols. I’m not sure how you’d get far past the primary colors, but it is an interesting concept. One of the things we are trying to be more aware of is explicit design. Rather than refer to colors by their hue, you refer to them by a language agnostic symbol. The two problems is that it adds an extra level of abstraction away from the color itself, but also then assumes you know or can figure out the rubric of the symbols. If we were to be explicit about this, we should simply use the string which represents the color. Rather than a symbol for the color red, how about the text RED? The downside of this is internationalization. Red is not always red in every language, or even written with the same ASCII glyphs. Then across cultures, you have issues with the lack of concepts for a color. In Japanese, the color Green is a tricky one. Ao is the concept for our western idea of Blue and Green. Color isn’t always as simple as you’d think. A better, but more cumbersome version of color identification might be to do away with all the names and abstractions and define them as RGB, HLS or HEX values. The issue there is that it is very complicated to go from a series of numbers to the right color. ColorAdd is a fascinating idea. Friends have contact them to attempt to get them to open source or put their symbols into the creative commons so more people could adopt and use them. If they want this to become a defacto standard, then holding them close to their chest and licensing it to only a select few willing to pay the price won’t spread the idea as far and wide as it could possibly go. In the mean time, every time we use these colored pencils, we’ll have a second thought about accessibility and the choices we use to convey information.